Very nice coaster, with some great air. It can be rough in some spots but not at all as bad as Mean Streak or Son of the Beast. If you love air time you really need to try this.You start the ride going up a 120 foot hill and drop down at about 60 miles per hour. You then go over about five more huge hills. You hit the turn around with some good speed and then go down another pretty big hill. After that you do a double up and go over a trick track at the bottom. You do some bunny hills and then hit the most intense part of the ride the helix which ends the ride. This really is a very nice all around ride. My first couple of rides on this coaster were far inferior to the following 8 that I took, so luckily I stuck with it. My first couple of rides were around 11 in the morning, the first in the back and the second near the front. Both were lacking in airtime from what appears to be a track built to keep riders flying out of their seats, so I was disappointed. Surprisingly, the ride in the front had more airtime than at the back which is almost unheard of on a woodie. However, since the rest of the park is lacking in thrills, I had to either stick with Timbers or drive elsewhere. Being either an optimist or a slow learner, I decided to try at least a couple of more rides before heading over to see the parks other offerings. It was a wise decision. I guess Shivering Timbers, like me, is not a morning person, because as the sun came out and morning turned to afternoon, it became a much better coaster. Subsequent rides delivered the expected airtime, especially in the back. I found that the right side delivers a slightly rougher and wilder ride than the left side, but both are still very smooth for a wooden coaster of this size. The layout is a bit boring with mostly just airtime hills. The trick track and helix are welcome to break things up a bit. Although I do love airtime, variety is the spice of life. The ride overall reminded me of Ride of Steel at Darien Lake in wooden form. Although, the helix on this coaster is one of the most intense that I have experienced on any wood or steel coaster, unlike Ride of Steel. There is not much scenery from the coaster with the parking lot on 1 side and the area where the railway ride travels on the other. Overall a very good wooden coaster, but not quite the best. Since, it reminded me of Ride of Steel, I will give it the same rating. A solid 9. If you get a bad ride on this coaster, like I did, definitely give it another couple of shots. it when you drive into the parking lot.It certainly is nicely designed. As a Michigan native, I can proudly say that Shivering Timbers is one of the best coasters Ive ever been on, if not THE best. Its an out-and-back with a punch, and plenty of airtime on those three big hills. Sure, it could use some more landscaping, since the C.P. Hunnington train rides nearby, but airtime, helixes, what more do you need for an excellent ride? Awesome out and back with plenty of airtime and huge hills. Loved the whole ride. This is what a coaster should be! Wow. What an amazing ride. We all know about the airtime and I can confirm that it is out of this world. The whole ride is great and there is more than just the airtime on every single hill. The final helix is extremely powerful, the trick-track is very unique and the turnaround has some very impressive laterals. The only thing keeping this ride from topping Hades, Boulder Dash, and Legend for my #1 wooden coaster is the constant "breaks" provided from the time spent climbing all of the massive hills while the other three seemed more relentless. I literally laughed for the whole ride the first few times I went on. Honestly, though, my favourite wooden coaster - even if its lacking in any sort of change of pace. Its basically hill, hill, hill, hill, with a couple of laterals thrown in to break it up. Timberman pretty much said it best - however I enjoyed the coaster quite a bit more than he did, it appears, and thus you can replace "monotony" or any other seemingly-derogatory word, and replace it with "AWESOME". Ive been dreading writing this review since I last disembarked from Shivering Timbers three days ago. The last thing I want to do is criticize one of the most daring and ambitious (not to mention popular) wooden roller coasters built in the last decade. Yet after giving myself time to reflect on the experience and after carefully weighing the rides many fine qualities, I cannot escape the conclusion that this ride, as a whole, was a qualified disappointment. I say qualified because its everything its cracked up to be: fast, intense, filled with airtime. But for me, the whole seemed less than the sum of its parts. I respect the ride, but I simply didnt have much fun with it. I had one transcendent moment in the front seat as the car fell away beneath me on the first drop and then gently rose up under me on the pull-up into the second hill. Three hills later, however, the ride became...and Im sorry, I dont know how else to put this...monotonous. Not as in boring, mind you, but as in monotone, a beautifully rendered note repeated so often and so insistently that I eventually longed for some syncopation, some flourish that would break-up the techno-like rhythm of the ride. I finally got my wish with the helix, a virtuoso finale, to be sure, but one that seemed more like a tacked-on coda than an integral part of the overall composition. I rode again and again, straining to feel the magic, but for me, it just wasnt happening. The first drop, the turnaround, and the transition into the helix all were moments of inspiration, but as I whole, I found the ride too repetitive and one-note to rate among the classics. This, of course, is an entirely subjective assessment. Without a doubt, Shivering Timbers is as impressive and uncompromising as any wooden roller coaster I have ever ridden. 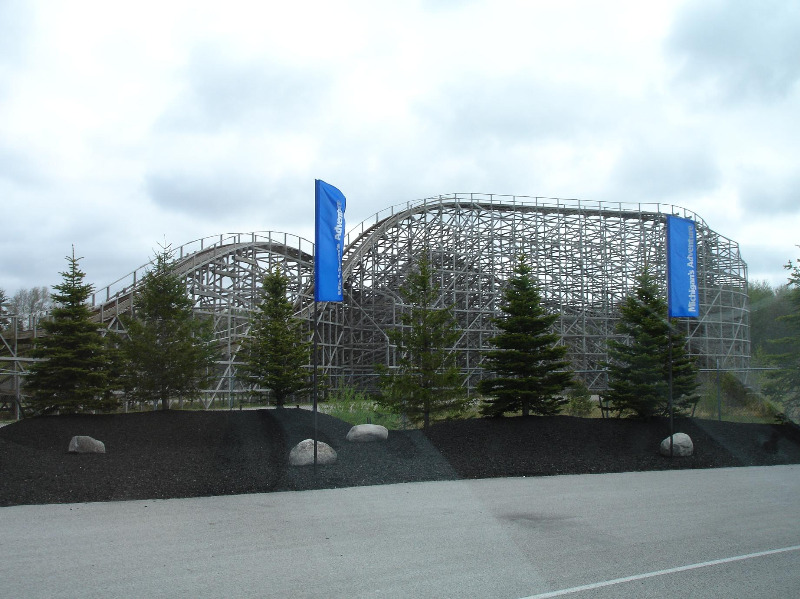 I applaud the fact that Michigans Adventure and CCI went to such lengths to celebrate airtime, and Shivering Timberss devoted following proves just how worthy an undertaking this was. But for me, the ride is proof that you can have too much of a good thing, especially when its repeated over and over without interruption. This may be the mark of devotion, but it is not what I consider the pinnacle of roller coaster design. This woodie is the biggest ive ever seen and has the hills to match it too. The first drop is huge and it is steep but instead of going to drops half the size or less, the second drop is just a tiny bit smaller than the first drop and the third is about the same in height as the second one. This means a whole lot of airtime and i enjoyed myself on it. It is an out and back and it is really one of my favorites. At the end is a spiral that goes really fast and they take your picture once u reach the middle of the spiral. Everyone who loves airtime and huge drops will absolutly love this woodie.